Coalition for Networked Information Introduction and Program Plan 2016-17 go.nmc.org/cnipro (Consortium of Networked Information, accessed 20 February 2017.) CNI has produced a program plan that has three major features, including transforming organizations, professions, and individuals, under which spaces and services that support technology-enhanced research and learning reside. Evaluating and Designing Learning Spaces Guide go.nmc.org/jisceval (Jisc, accessed 20 February 2017.) Jisc’s website provides a quick guide to the evaluation and design of learning spaces, covering assessment methods, project management, and the design process. Imagine Our Library go.nmc.org/ucdlib (UC Davis University Library, accessed 20 February 2017.) The UC Davis Library is soliciting suggestions from students, faculty, and researchers about how the library’s space, technology, and services can best serve their needs. Phase one involves visioning, phase two focuses on detailed programming, and phase three is the actual design. 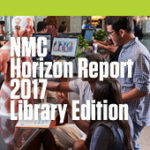 Library Refurbishments go.nmc.org/refurbish (The University of Western Australia Library, accessed 20 February 2017.) The University of Western Australia libraries are transforming to provide more interactive, flexible, and collaborative spaces. Once home to print collections, the Medical and Dental Library will be renovated with e-learning suites, computer training facilities, and collaborative learning areas.